The Padded Harness Vest is made of two layers of weather resistant, 1000 denier nylon/urethane coated fabric. The inside of the vest is padded for your dog's comfort. All seams are bound and reinforced for added strength and durability. On one side of the harness is a plastic swivel snap. The snap can be used to attach the Clip-On ID Carrier or other equipment. The handle on this vest is preformed and contoured for better comfort and workability. The back of the ID will have the law that pertains to this type of dog and the protection from FHA/HUD & FAA. 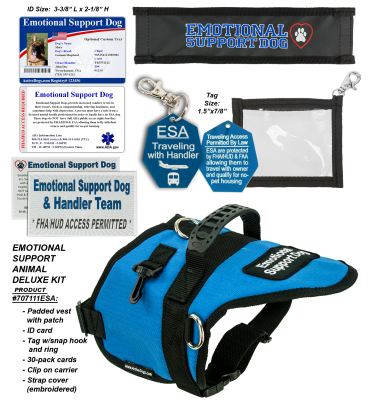 Emotional Support Dog tag states on one side that this is an ESA traveling with a handler and the other side is the FHA/HUD & FAA protection information. Includes a trigger snap clip.